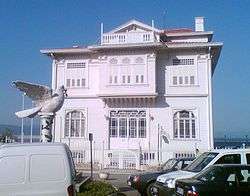 Mudanya (Mudania, Greek: τα Μουδανιά [Pl.]) (the site of ancient Apamea Myrlea), is a town and district of Bursa Province in the Marmara region of Turkey. It is located on the Gulf of Gemlik, part of the southern coast of the Sea of Marmara. 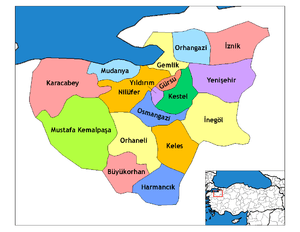 As of 1911, it was connected with Bursa by the Mudanya–Bursa railway and a carriage road, and with Istanbul by steamers. Mudanya has only an open anchorage usable in calm weather. The town produces olive oil and there is a pier used by local fishing and cargo boats. After the Treaty of Lausanne and the Greco-Turkish population exchange agreement, the Greeks of the town were transferred into mainland Greece, establishing a settlement to which they gave the name of their previous town, Nea Moudania (New Moudania, located on the Chalkidiki peninsula, in the Macedonia region of Greece.) In return, a number of Cretan Turks were settled in Mudanya. 1 2 Prothero, G.W. (1920). Anatolia. London: H.M. Stationery Office. ↑ Chisholm, Hugh, ed. (1911). "Mudania". Encyclopædia Britannica. 18 (11th ed.). Cambridge University Press. p. 955.